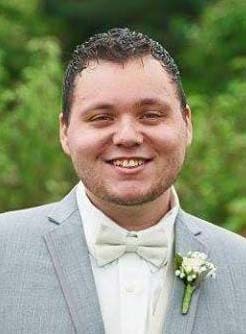 Dillon Lee Cupples, 26, of Newton died on Tuesday, September 11, 2018, at Mercy Medical Center in Des Moines. A memorial service will be held at 5 p.m., Tuesday, September 18, followed by a visitation until 7 p.m. at the Wallace Family Funeral Home and Crematory. Memorials to Dillon’s family to be used for Rylan’s education or for Jasper County conservation efforts may be left at the funeral home. Dillon, the son of William Lee Cupples and Kelly Lea Beadle, was born on September 23, 1991 in Des Moines. He grew up in Newton and graduated from Newton High School in 2010. On October 1, 2016, Dillon was united in marriage with Leah Johnson in Newton. Dillon was employed by Gates Corporation making hoses for John Deere. He enjoyed time with his family and friends, fishing, wood burning, x-box gaming, and football (Go Patriots!). Dillon is survived by his wife, Leah Cupples of Newton; son, Rylan Cupples of Newton; father, Bill Cupples of Newton; brother, Drake Cupples (Blake Ledbetter) of Newton; sister, Destiny (Nate) Balk of Newton; half-brother, Scott Cupples; niece, Gracelynn Balk; nephew, Zander Wolfe; his grandparents, Joyce Dunn, Steve Archer, and Phyllis Ballard; and father-in-law and mother-in-law, Ken and Teresa Weiland of Newton. He was preceded in death by his mother, Kelly Beadle and grandpa, Ronnie Beadle.